In 1990 there was the Immigration Act and 50 immigrants died crossing the border, in 2001 the Patriot Act and another 391 deaths at the border, and in 2003 when Homeland Security emerged, 431 lives ended at the border. Are there any connections in these facts? Or is there meaning in who served as president, mayor or governor at one of these junctures? These are the questions that a viewer asks while looking at a new exhibit: Sanctuary City/Ciudad Santuario. 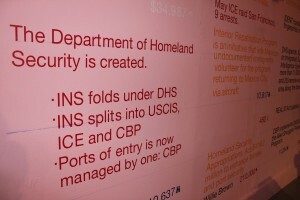 In it, local Mission District artist Sergio De La Torre along with five students from the San Francisco Art Institute and U.C Berkeley have constructed a timeline of the last 20 years of immigration history that scrolls the pink walls of the Queens Nails Gallery on Mission Street. Starting in 1989—the year the San Francisco Board of Supervisors declared San Francisco a “City of Refuge,” for undocumented immigrants, the timeline displays the changes that have taken place since then by using the data of immigration. Symbols illustrate the number of border patrol officers, detentions at the borders, immigrants deported, border crossing deaths, and the amount of money sent to Latin America in remittances each year. A video placed at the beginning of the timeline shows a car driving through the Mission’s streets. It offers a reminder that it is up to each individual to navigate the timeline of facts. Although it took the artists over two years to collect the data from newspapers, policy briefs, think tanks, and help from mission district nonprofits, De La Torre acknowledges the information is pretty generic. The art happens in the visual juxtapositions that allows viewers to take in the facts as a whole and to make connections impossible to see without having the data side by side. Born on the Tijuana/ San Diego border, De La Torre saw first hand the divisions that developed along the border. And even though he was born a U.S citizen he describes his experience as a reverse migration experience. “I took on jobs as a janitor and restaurant worker before I was able to get a bachelors and masters degree,” he said. 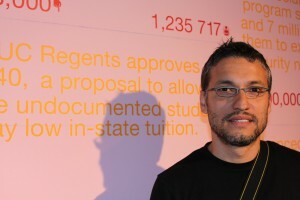 Now a teacher of art and architecture at the University of San Francisco, De La Torre has spent the last 20 years producing work around immigration topics. With this project he became more interested in the people behind the events. “The idea is to make sense of the last 20 years of San Francisco history,” said De La Torre who wants the Mission’s Latino residents to add their perspective to the timeline’s events. “ I want people to be able to say my cousin was deported in 1995 and now you can see it here, “ said De La Torre.That night, no one had yet contributed. Located behind the timeline in a small dark room the victims speak. “This is tearing my family apart,” a young boy who talks about his father’s recent deportation, tells a recent Immigrant Rights Commissions hearing. In another of the audios, a Spanish speaking older male describes being racially profiled by cops. “They said they pulled me over because I had a rosary hanging from my rear view mirror,” he says describing that the religious item as being associated with Latino drivers. But, less effortless in this exhibit is a component that features wooden maps of the Mission District divided into census tracts. 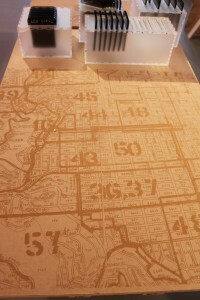 Placed on top of the maps are plastic sleeves that present census data information from the Mission dating from the 1980s. Unfortunately neither the maps nor data are clear enough to fully understand the changes that have taken place in the neighborhood over the years – something De La Torre, an on and off again resident of the Mission District since the 1980s, knows well. “Exciting, sad, convenient, drastic and almost impossible to take a position on, he says of the changes. Although he’s shocked by the gentrification he says that the changes have also helped eliminate the street gangs that would have prevented him from raising a family in the neighborhood. A mini version of the exhibition’s timeline is available in poster size for participants to take home. The back list of resource and legislation information for undocumented immigrants.